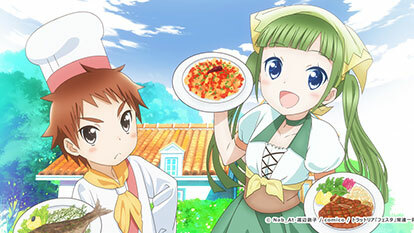 While on her summer break, Morina Nanase starts a new part-time job as a waitress at Trattoria Festa, an Italian restaurant. Finding the restaurant adorable and coincidentally close to her house, Morina quickly settles into her new profession. However, her new job comes with several eccentric co-workers and Italian dishes she has never heard of. The restaurant's typical fare includes a variety of pasta dishes such as penne arrabbiata, rich dessert such as tiramisu, and even caponata. Join Morina in her restaurant adventures as she gets to know her co-workers and serves the best Italian cuisine to her customers with a smile.